I had an exciting Christmas present from Chris Simmons at crimesquad.com. 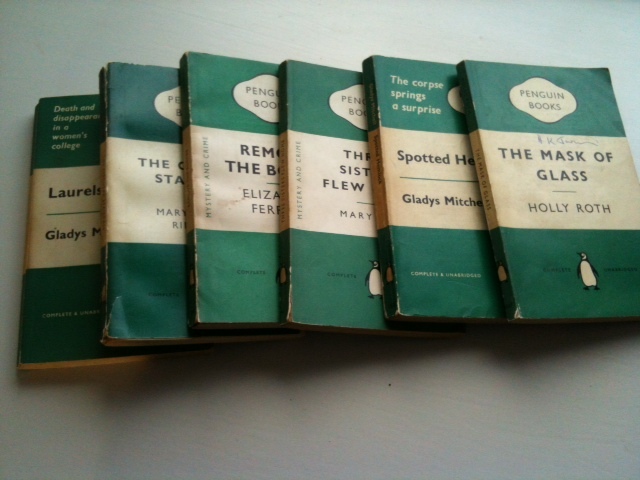 Six vintage penguin crime books and all by women too. Last night, looking for something to read I idly flicked through the opening paragraphs of each of the books. This is the one that grabbed me: ” This is the story of how a middle-aged spinster lost her mind, deserted her domestic gods in the city, took a furnished house for the summer out of town, and found herself involved in one of those mysterious crimes that keep our newspapers and detective agencies happy and prosperous.” There was something irresistable about the opening line and happily it was a foretaste of things to come. The central character is Rachel Innes, the middle-aged guardian of her orphaned nephew and niece, Halsey and Gertrude. She decides to rent a large country house for the summer and on the second night of her residency a man is found murdered. As the investigation into the killing progresses the house becomes the focus of increasingly strange activities and further unexplained deaths. I have to admit I was a completely ignorant of the writings of Mary Roberts Rinehart and read it without any preconceptions. What immediately struck me was how modern the book was. Written in 1908, in England this is the period of Sherlock Holmes and Raffles and the Victorian era has not yet been shaken off. However, in the US, Rinehart wrote this book which seems to me to be firmly set in twentieth century America. Embezzlement, revolvers in the shrubbery, young women fleeing across the country by railroad. This is a country house mystery you couldn’t have written in England, although there is a whiff of Victorian (Wilkie Collins) melodrama about the plot. The books greatest strength is the narrative voice of Rachel Innes. She is wry and self-deprecating, well aware of her limitations and strengths. There was one aspect of the narrative that I initially found distracting which was the continual references to events in the future – identifying characters for example who will play an important role later in the book. A quick search of the internet this morning reveals that Rinehart was the inventor of the ‘had-I-but-known’ type of mystery where the first person narrator hints of impending disaster that could have been averted if they had been equipped with knowledge that is later acquired. I didn’t find it irritating in this book but can understand how it could easily become a cliché. I liked the sense of irony and the glimpse of a world that I don’t often read about. I’m not sure how easily available the other books are but I’d definitely like to read her again. There’s a good review at Redeeming Qualities by a blogger who has read more of Rinehart’s books. Sarah – What a wonderful Christmas gift! I’m glad you liked Rinehart’s work, too. I admit I’m not thoroughly familiar with her writing but what I have read has impressed me with its force of writing and sense of place. I’m glad you mention the narrative voice, too, as that’s another feature about her work that I like. Thanks Margot. Yes I was very lucky with my Christmas presents this year. Sounds an intriguing book. In a way it reminds me a bit of The Ladies of Lyndon by Margaret Kennedy (which I preferred to her more famous The Constant Nymph), which I read as a Virago modern classic in that green edition a tiny bit like your penguins! Seeing those classic penguins reminds me of when I was a child – my parents had hundreds of books but my Dad had some bookshelves in the attic that were stuffed full of penguins that he bought as they were published. I enjoyed reading so many of them. Agreed, a great Christmas present! I’ve not read any Margaret Kennedy, Maxine. An author to try sometime I think. Mary Roberts Rinehart’s books made an appearance on a suspect’s bookshelf in the book I have just finished – The Man in the Queue by Josephine Tey. I was intrigued by your first paragraph an hooked when you mentioned the strength of the narrative voice. Experience has taught me that green Penguins by unknown authors are always worth investigating. I discovered Mary Fitt and Holly Roth that way, though not the books you have, and can recommend the writing of both. Fleur – I’m looking forward to reading both the Holly Roth and Mary Fitt. Both books sound interesting. I didn’t realise you enjoyed classic crime too. You obviously read widely. Great review. There’s lots of Rinehart in old paperbacks out there to enjoy. Another good spinster murder tale by her is The case of Jennie Brice, which is set during a great flood in Pittsburgh. I read this one a few years ago and was a bit disappointed because Rinehart was supposed to be on a par with Agatha Christie. It’s more like a piece of literary history to me than anything else. But you’re very right when you say that she’s a lot more modern than, say, Sherlock Holmes. Yes I saw the “American Agatha Christie” tag too. It’s not the case – but I enjoyed her own style.